Every year we all look forward to the company BBQ at Bruce’s good food, drinks and company. Horseshoes was replaced by a similar game that you toss bean bags and instead of a pole it’s a hole. Stewart’s kids make a beeline for the pool while the rest of us watch and chat. I loved when Stewart’s youngest son tried the dark chocolate coated ice cream, “ DISGUSTING” as he handed it to his mother, his face must have resembled mine at that age the first time I tasted semisweet cooking chocolate, not what I expected. Anyway, Bruce’s wife Kathy made the best broccoli salad I have ever had, it disappeared very quickly. Thanks Kathy’s this was great!! She said that she does not follow the amounts exactly and to me that is what cooking is all about tweaking to your likes. 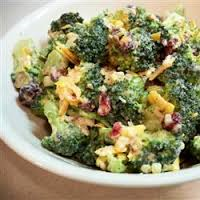 This entry was posted in Salad Dressings, Salads, Side Dish and tagged broccoli, Cheddar cheese, mayo. Bookmark the permalink. Outstanding expert articles and style of article writing. available! 😉 I’m just going to discover if my husband and I can track down something with regards to cooking with stefano recipes!! work and reporting! Keep up the superb works guys I’ve you guys to our blogroll.